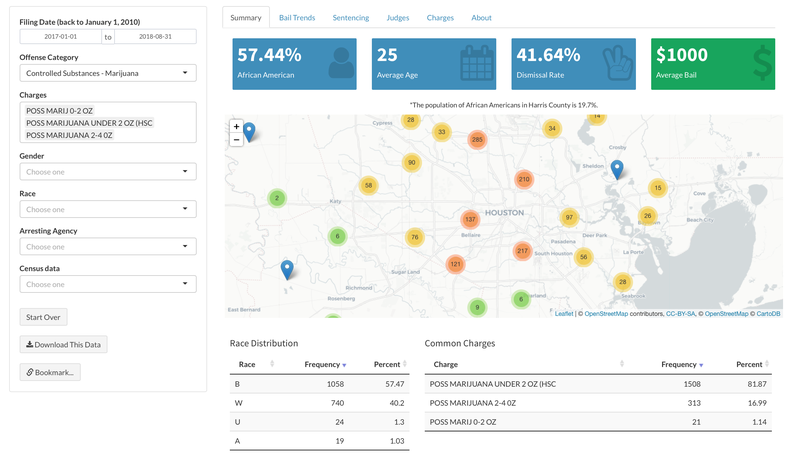 Last year, we partnered with the Texas Criminal Justice Coalition to develop the first version of the TCJC Dashboard. Since then, we’ve been working behind the scenes to push the limits of what we can learn from these data. Thanks to generous funding from Microsoft, we developed a new version of the dashboard and a criminal court data API. We kicked off in style at the office of Harris County Commissioner Rodney Ellis. He convened criminal justice advocates from across the region, while Jay Jenkins from TCJC explained several ways that anyone can use the dashboard. Together, we gathered feedback and ideas from the advocates. Commissioner Rodney Ellis hosted a meeting with criminal justice advocates where we debuted the TCJC dashboard. 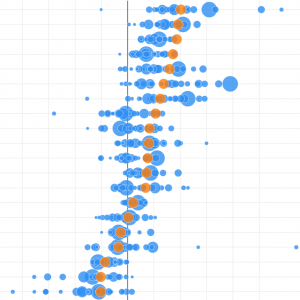 The criminal court dataset contains a lot of stories waiting to be discovered. If you’ve been reading this blog for a while, you might remember that we’re paying attention to low level marijuana arrests. In the spring and summer of 2016, there were hundreds of arrests for low level marijuana offenses every month. Then the voters of Harris County elected Kim Ogg, a progressive candidate for District Attorney of Harris County. She pledged to divert misdemeanor marijuana cases from the system. DA Ogg took office on January 1, 2017. It’s been about a year and a half. Is she making good on her promise? I wanted to use this dashboard to find out. What are low level marijuana charges and what do they represent? Typically, low level marijuana charges refer to possession of “two ounces or less.” However, Kim Ogg’s program considers possession of up to four ounces as candidates for diversion, provided it’s not in a school zone or another restricted area. 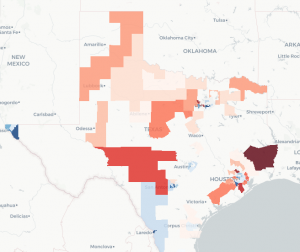 The most successful ideas for marijuana reform in Texas happen to be diversion programs. They are in place in San Antonio, Austin, and they offer some offenders the opportunity to avoid any arrests, charges, or convictions on their record. That’s why looking at court data is so important: it’s where we can track if the District Attorney is being true to her word. Across the country, other states not named Texas have fully decriminalized and legalized marijuana. San Francisco took a bold step in dismissing prior marijuana convictions that go back as far as 1975. Seattle vacated prior convictions and dismissed charges. This makes sure that a criminal history of marijuana doesn’t limit future opportunities. It’s only a matter of time for Texas. 53% of registered voters believe that marijuana should be legal. That number keeps growing every year. In 2014, there were 11,098 misdemeanor marijuana cases filed in Harris County. In 2015, there were 8,439 misdemeanor marijuana cases filed in Harris County. In 2016, there were 7,989 misdemeanor marijuana cases filed in Harris County. Because we are looking at cases by their filing date, we can see exactly when there should be an expected drop in cases filed. The District Attorney began her term on January 1, 2017, and the first chance diversion program officially launched on March 1, 2017. By that time, DA Ogg’s policies were already making an impact. There is a noticeable and long-term drop in misdemeanor marijuana cases filed after DA Ogg took office. In addition to a decline in cases, there is also greater parity in bail amounts by race. 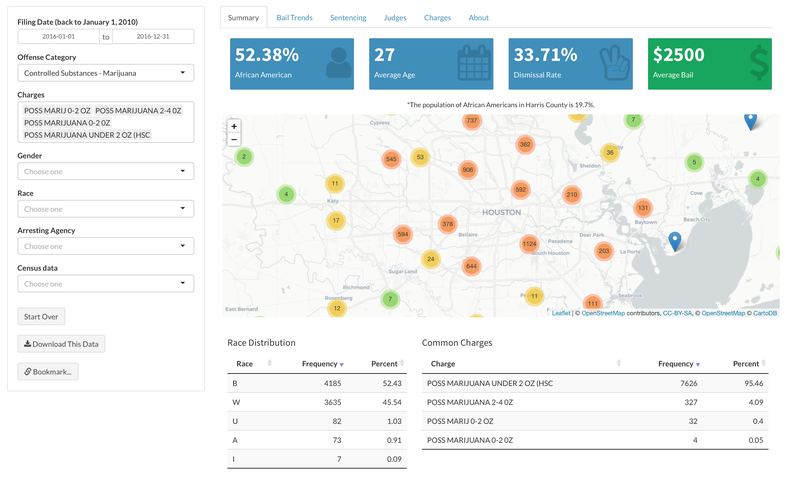 One of the highlights of the dashboard is the ability to clearly see the differences in outcomes by race. Why are there any misdemeanor marijuana cases at all? There are several reasons why low level marijuana charges still appear in the court data. First, if you fail to complete the required class for the diversion program, there will be a warrant issued for your arrest. Some of the cases are simply people who missed the class. Marijuana is still illegal, after all. 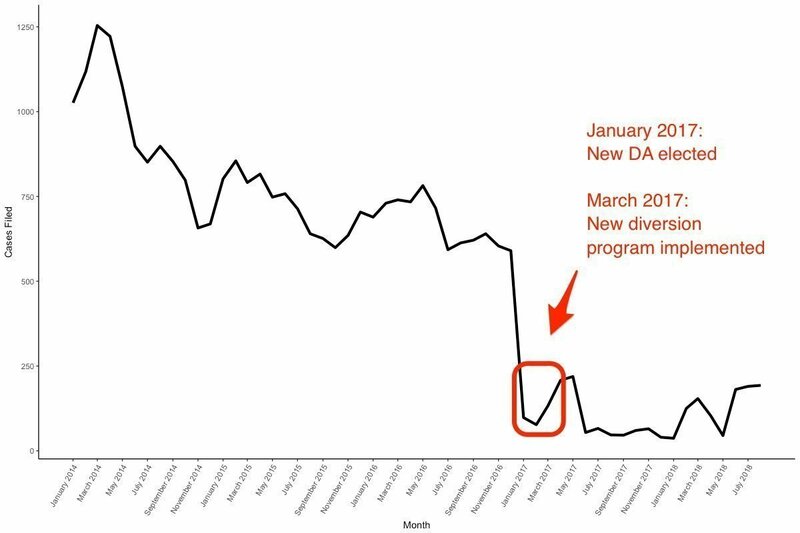 Examining the differences between arresting agencies since the diversion program took effect. And although it’s rare, some low level marijuana offenses might be a lesser charge than what prompted the initial arrest. 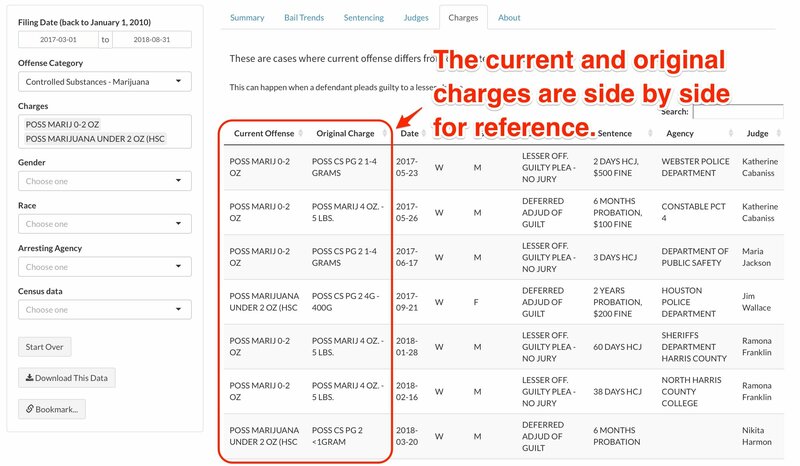 The Charges tab on the dashboard highlights all of the cases that began with a more serious charge, and sentenced based on a lesser charge. There are approximately 20 – 50 of these cases each year. The data show that there are much fewer low level marijuana cases in the court system after DA Ogg took office. Still, there is room for improvement. 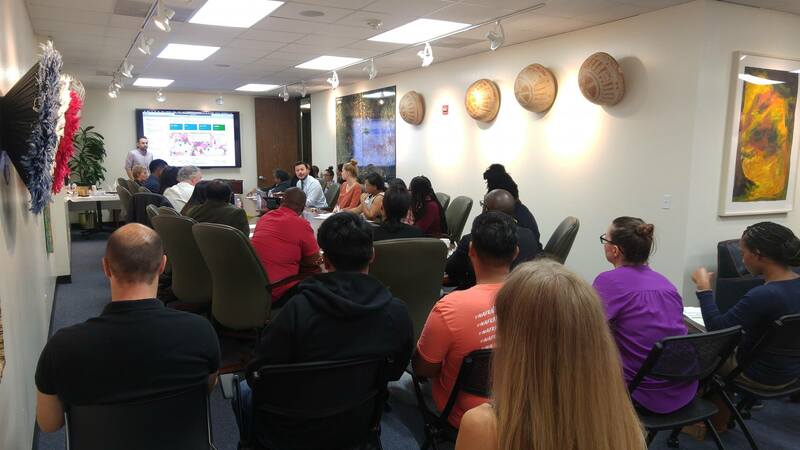 Although Ogg’s diversion program is progressive for Texas, there is more to do. We are moving towards decriminalization in Harris County and Texas. DA Ogg and others should take a cue from San Francisco and Seattle and work towards the automatic expunction for everyone arrested, charged, or convicted of low level marijuana offenses. Simply diverting them from the system won’t be enough for much longer.